FILE - Ryan Zinke, U.S. interior secretary, responds to a reporter's question during a news conference after touring the fire-ravaged town of Paradise, Calif., Nov. 14, 2018. U.S. Interior Department Secretary Ryan Zinke said Tuesday that the deadliest wildfires in California's history were partly due to lawsuits from environmentalists who have sought to stop forest management practices, such as forest thinning. "Radical environmental groups that would rather burn down the entire forest than cut a single tree or thin the forest" have brought lawsuits to stop forest management, Zinke told reporters in a teleconference about the California wildfires. "Yes, I do lay it on the feet" of environmentalists, he said. Remains of 79 victims have so far been recovered since the Camp Fire erupted on Nov. 8 and largely obliterated the town of Paradise, a community of nearly 27,000. Zinke did not name specific groups, saying he did not want to point fingers. He said other factors, such as hotter temperatures, historic drought conditions, and plenty of dead and dying trees also were also to blame. Randi Spivak, lands director for the Center of Biological Diversity, an environmental group that has sued the government over forest practices, said there have been just 38 lawsuits over the federal government's 576 forest management decisions involving California from 2009 to 2017. "When Zinke says it is due to extreme environmentalists, he has no basis in fact," Spivak said. She said climate change and increased development of forest zones prone to wildfires caused the destruction. Zinke first blamed environmentalists in an interview on Breitbart News after visiting communities hit by the California wildfires. 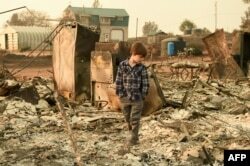 FILE - Jacob Saylors, 11, walks through the burned remains of his home in Paradise, Calif., Nov. 18, 2018. The family lost a home in the same spot to a fire 10 years prior. Another environmentalist said blaming green groups was easier than curbing emissions linked to higher temperatures and droughts. "The only radicals here are Trump administration officials who are exploiting a climate tragedy to try to benefit their friends in the timber industry," said Abigail Dillen, president of Earthjustice. Germany was a model of forest management, Zinke said. President Donald Trump, while visiting California, said Finland's President Sauli Niinisto had recently told him the country rarely has wildfires because "they spend a lot of time raking and cleaning and doing things" to clear the forest floor. Niinisto has said raking did not come up in his conversation with Trump. U.S. Agriculture Secretary Sonny Perdue said forest management practices need to be accelerated, and he hoped that U.S. agencies could get more authority to do so under a farm bill being debated. "There are things we can do. We need the authority to do that," he said. The Department of Agriculture's Forest Service would like to expand the "good neighbor authority" it has with U.S. states to Native American tribes, counties and other partnerships to protect homes and lives through cooperative agreements or contracts, Perdue said. The Bureau of Land Management and the Forest Service would also like to expand categorical exclusions that allow forest thinning in areas damaged by insects or diseases to prevent fires, he added. But Perdue said it could take years for authorities to catch up on forest management, such as thinning out the fuel of dead trees and dry underbrush, and improving emergency roads.